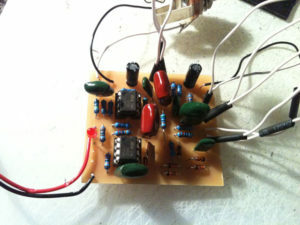 Big Muff clone built using a GutiarPCB.com PCB. I’ve always loved the Smashing Pumpkins first few albums, and the great big dirty Big Muff tone that was on those albums. I’ve been reminiscing in particular about Siamese Dream, my favourite Pumpkins album. I decided that I had to build myself a Big Muff clone. I originally was planning on building the Op Amp version f the Big Muff on vero board like my first couple of pedal builds, but then I saw that Guitar PCB was having an introductory 2 for 1 sale on their newly released Tonmann enhanced Op-Amp Big Muff Pi PCB. I thought it would be fun to build a couple, so I went ahead and picked them up. I finished populating the first board over the weekend, and decided to hook up some jacks and a battery snap to test it out before I box it up. I plugged it in to my Blackstar HT-5 and cranked up the clean channel, and the result was big thick Muff tone, just as I had hoped. I played a bit of Today and Cherub Rock to commemorate it’s first play. I was short a few resistors for this build, but fortunately I had some that were a few kilo-ohms off the required values and they seemed to do the job. I’m planning on trying out a few circuit mods to make this Big Muff clone as versatile as possible before it’s all boxed up. Stay tuned for part 2. 2 Responses to "New pedal build: Big Muff clone part 1"
So how is the pedal now that you’ve swapped the required resistors? I stuffed a board last night and used the revised values. I sort of wish I had built it with the original specs. I’m still very happy with my results. I can switch between stock and my raised mids setup. I mostly use the modified setup.